In today's Gospel, Jesus teaches from Simon's boat. Jesus turns to Simon and instructs him about where to lower the fishing nets. Simon and others have been fishing throughout the night and have not caught anything. Simon protests, claiming that such an effort would be futile. Simon’s fear of failure stops him, but he ultimately obeys Jesus and lowers his nets into the deeper water as directed. Fear can be paralysing, it motivates us to maintain the status quo and to resist growing into who God is calling us to be. Fear is what made Saul of Tarsus, who would later become the apostle Paul, persecute Christians. Fear is what makes us believe we are not worthy of being loved—by others, by ourselves, and by God. Fear casts out reason. Fear lacks God’s imagination of wonder for the future. Yet, this is where God finds us. Just like Jesus found Simon Peter in his boat and Paul on the road to Damascus, God comes to where we are and asks us to do something that seems unthinkable, laughable, bizarre, or just plain scary. We do not have to be perfect in order for God to want to be in relationship with us. We just have to be willing to drop our own baggage around our fears and follow, like Peter, James, and John did when they brought their boats, overflowing with fish, to shore. Jesus tells Peter, James, and John that they should not be afraid of what has happened and that from then on, they would be catching people, too, just as Jesus has caught them—by being with them where they were and exemplifying the blessing and abundance of God. In leaving everything and following Jesus, they immediately reorder their entire lives, with Jesus at the centre of every decision they make. To be called by God to follow Jesus takes more than just a willingness of heart and living through our core Christian values. It takes the humble response : I will, with God’s help. We have the will, but God is the way. 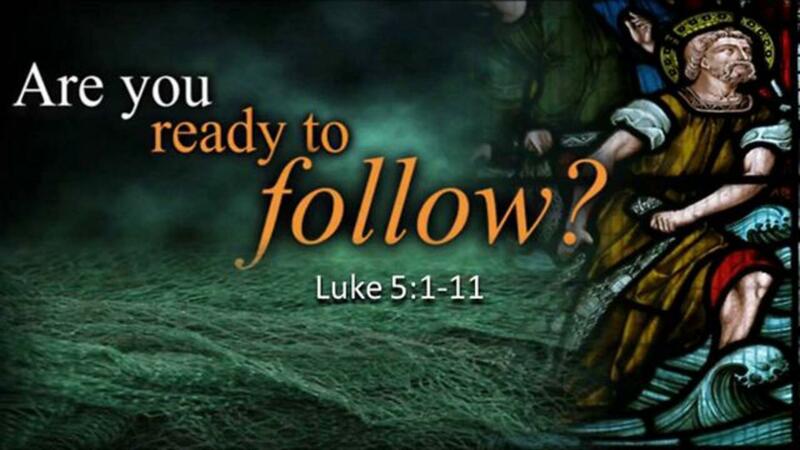 We must actively choose to follow Jesus and we need God’s help to do so, as that road is unknown and will present us with challenges and joys which we are unable to predict. In our modern time, we have control over a great many things in our lives and therefore perceive that we can control everything, including other people and events. When we come up against uncontrollable circumstances, we are often at a loss. In a difficult circumstance, people may tell us platitudes such as “There’s a reason for everything.” Although the person means well, these sayings are not helpful when facing a life-altering event. Regardless if it is a positive or negative circumstance that comes up, we are challenged to respond faithfully, knowing that Jesus is getting into the boat with us, no matter what. No matter if we deserve it or not, no matter how great our fear or joy is, Jesus meets us where we are and this is why we grasp his outstretched hand—unexpected, full of grace, in invitation—and we follow. They catch so many fish that the nets begin to tear; Simon Peter becomes a follower of Jesus immediately. He calls Jesus “Lord”—the title given to Jesus after his Resurrection—and protests his worthiness to be in Jesus' presence. Jesus says to Peter as he says to us. “Don’t be afraid.” Don’t be afraid of your sinfulness and your shortcomings. Don’t be afraid to try something new. God can and will use us. In fact , God needs us to fish for others and to use our sins and our shortcomings as bait. We fish not out of our strengths- but out of our weaknesses! When others see how God has been at work in our lives; they might just be willing to let themselves be caught in the net of God’s love and be transformed by God’s forgiveness.